For our 15- and 100-ml bioreactors, the top is machined from PEEK (a thermoplastic polymer). PEEK is gas impermeable and mechanically robust, allowing us to include threaded holes for stainless steel fittings. It is also temperature resistant, making it autoclave safe, and tolerates the cycles of acid and solvent washing common to reactor preparation. 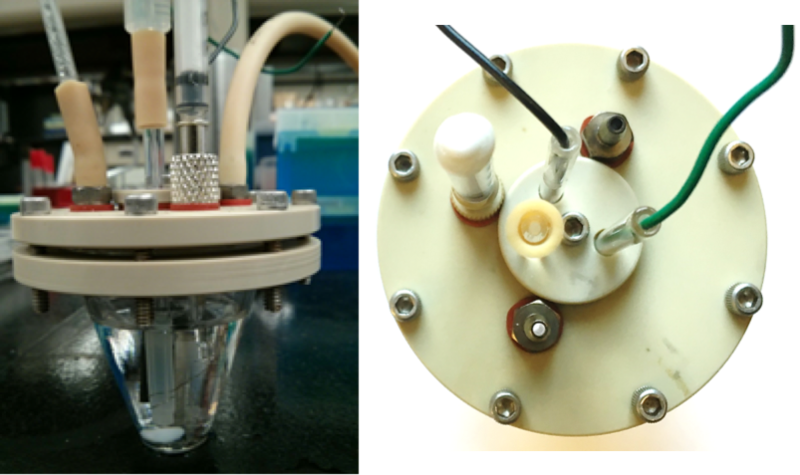 The bioreactor top has ports at the center to house three electrodes (working, counter, and salt bridge for a reference electrode). On the outer ring is an inlet port, an outlet port and a sampling port (Figure 1). The ports are sealed using gaskets cut to fit each section, and tightening of the center screw compresses the gasket, providing a seal on the glass tubing used for electrode leads. Stainless steel screws mounted around the outer edge pull a ring from below, compressing the top of the reactor in a gasket within a groove. The distance between electrodes and location of the reference relative to the working and counter is constant in every experiment, decreasing variability and increasing repeatability. We keep the reactors submerged in a water bath, stirred from below using low-noise magnetic stirring system, with the tops above the water. Having a ‘cool top’, plus a humidifier before flushing the chamber minimizes evaporation. 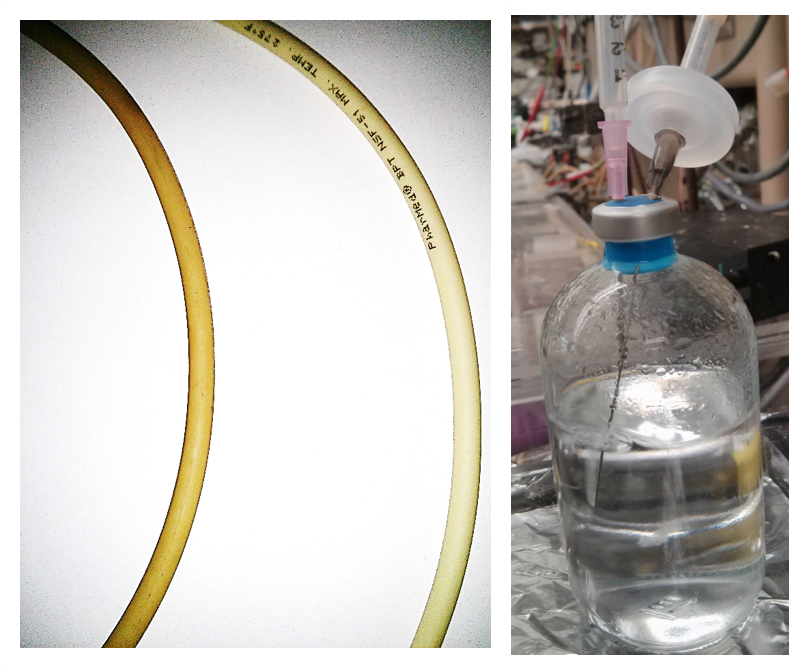 As tubing (such as Pharmed BPT) ages, such as after autoclaving multiple times, lines become permeable to oxygen and can add 8-10 ppm oxygen to the reactor between an anaerobic gas source and the inlet. Keep tubing as short as possible, and make hash marks on the tubing after each autoclaving to all disposal after 10 uses. A plastic filter that is often used upstream of the reactor or humidifier, with the intent of providing sterile gas. This plastic can also can contribute up to 5-8 ppm of oxygen. A glass tube filled with glass wool can filter gas as it enters the reactor system, and also does not clog as readily as filters. If the exhaust port is vented directly to the air, or even via a short tube, oxygen levels will increase over 20 ppm. Exhaust ports are typically connected to 6-12″ of tubing that terminates in a water filled flask, or can also be a vented via glass tubing bent into a coil. Use of a long glass spiral allows gas to cool will aid in capturing lost moisture during long incubations. With bacteria such as Shewanella, the presence of low levels of oxygen such as 10 ppm, will support growth of planktonic bacteria, and you can usually see a pellicle of surface growth trying to get at the oxygen. At the low levels of current typical of these organisms, low levels of oxygen cause 25%-50% of the electron donor to be respired to oxygen instead of electrodes. CAD drawings can be found here and here. 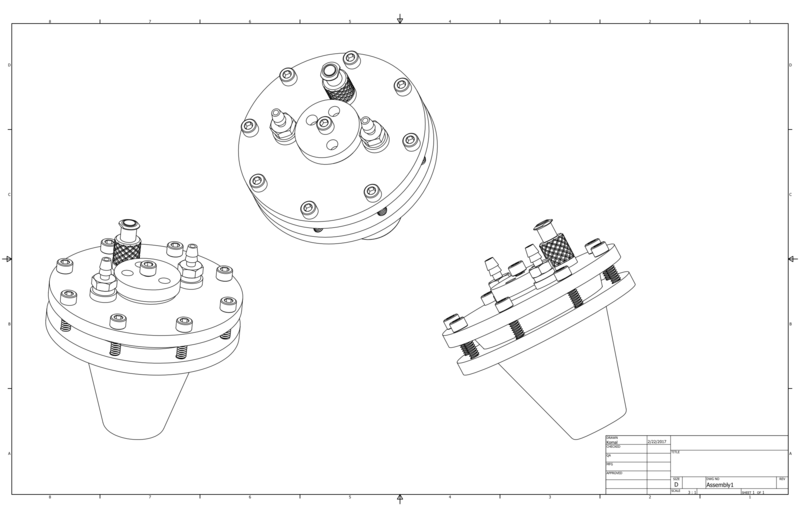 An illustration of the assembled parts (CAD .iam file) can be downloaded here. Send us pictures of your happy reactors!